Let me start off by saying that I’m not generally a poetry person. But I have been learning to appreciate it more, as well as figuring out what kind of poetry works best for me (which I’m beginning to think is the secret). Last year, I read poetry by Rita Joe and George Elliott Clarke, and what I liked best was the history and the emotion behind it. This year, I’ve learned that I like poems that tell stories. In After Swissair, Budge Wilson tells the story of Swissair Flight 111, which crashed into the waters near Peggy’s Cove, Nova Scotia on September 2, 1998, killing all 229 people on board. The poems in this volume come from many different perspectives of the event itself and the aftermath. It is still very much in the hearts and minds of the people living in the area, as well as the families whose loved ones were lost in the crash. The poem, Peggy’s Cove, left a lasting image in my mind of loved ones throwing mementos into the sea; flowers, teddy bears, and even golf balls. On one particularly blustery day, when it was too dangerous to get close to the ocean, firefighters formed a human chain so that the mementos could still be passed along. There are poems from the perspective of the fishers, the RCMP, the divers, the women baking up a storm, the military, and even some of the monstrous machines used in the search efforts. One of the parts I found very moving was when the author of the book was finally able, once again, to look at the ocean and see its beauty. Anyone who has been following me for a while knows how much I love Michael Crummey’s novels. Now I can say I also love his poetry. Little Dogs is a collection of both his old and new poems, and many of them are like reading mini stories. In an interview with Carol Off on CBC Radio, the interviewer described them as being like short movies in your head. She had Crummey read out loud his short piece “Bread“, and I loved it so much I immediately went home and requested the book from the library. I strongly encourage you to listen to the interview just to hear that piece. A lot of these poems are written about people and places Crummey has been hearing about his whole life; stories about his grandparents and their way of life. And some of them are more personal; ageing, memories of his parents, memories of childhood and adolescence, as well as life with his family. His poem about “manic chickadees” and their “needling racket” made me smile. He describes them as “an army of wind-up toys” whose “sole earthly purpose is reminding the unconscious world that morning’s not to be missed”. I share with him a fond childhood memory of what we always called “the dump” – you just never knew what you were going to find there. It was where ugly thrived. I borrowed this collection from the library, but it’s definitely one I’d like to own. Book Spine Poetry #1 and #2. I have only one poem to offer you this year. The other one I created was deleted from my camera, and it’s been too long to think of recreating it. But here’s the one my daughter helped me with when we were visiting my parents in March. It was my favourite, anyway. Do not say we have nothing. How about you? Have you read any poetry this month? Or created any? You know I love book spine poetry! This one is beautiful. The poets sound wonderful, don’t think I could bear to read the first one. Great post Naomi! As I’ve been weeding out my book boxes over the past, I’ve been thinking about book spine poetry a lot. But I’ve never been able to come up with anything decent. I’ll check out the Crummey poem. Ever since listening to his Sweetland, I imagine his voice to be just like the narrator’s one (John Lee). Now I can’t wait to hear what Crummey actually sounds like. Well, I just listened to a sample of John Lee, and I don’t think you’ll find Michael Crummey’s voice the same. However, he obviously knows how to read his own work! I hope you enjoyed listening to it! You are right, the voices are very unlike each other. I was startled every time I heard the grandfatherly voice in Sweetland use bad language. 🙂 I’m glad you included the link to Crummey reading his poem in your review. I really liked listening to it. I’m glad you liked it. Did you get to hear “Bread” – I just love that one. 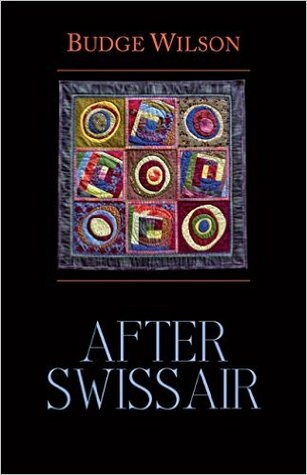 I very much like the sound of After Swissair. I, too, like poems that tell stories, often in response to tragedy. I can think of Christopher Reid’s A Scattering and Michel Faber’s Undying, both about a wife’s death from cancer, and Denise Riley’s Say Something Back, which is largely about her son’s sudden death. 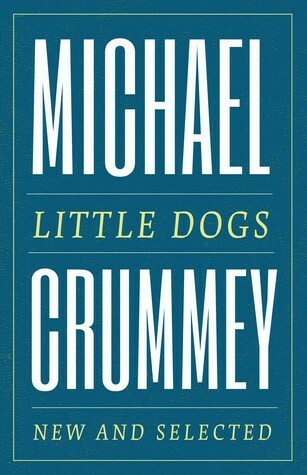 I’ve still never read anything by Michael Crummey, and would particularly like to get hold of his novels. I like your book spine poem! It’s almost like a haiku. I share your Michael Crummey love!! He’s such a wonderful writer and person. I find his poetry can be a bit edgier than his novels – but I love it all!! Great to see Book Spine Poetry back! And what a great one. I love that poem Peggy’s Cove. So beautiful. I haven’t seen a lot of book spine poetry around this year. I have found, after my flurry of it last year, that it seems a lot harder. Maybe others are experiencing the same thing! I have a hard tome with poetry, too, especially with long ones. But some of these are good. The more I read it, the more I realize I might not be as “dumb at poetry” as I thought! Which makes me want to read more. That’s good. I have been reading a little more, but I still think I’m “dumb” about it. I find that it took a while to figure out what I liked. I still laugh when I think about that poetry book we read for Wives a few years ago. It was hilarious! Were you a member then? I mean hard time. I hate autocorrect! I really like the book spine poetry! I first came to know of Michael Crummey as a poet before he published novels or short stories. He was in town last fall and I heard him read from Little Dogs and share the stories behind some of the poems.So I not only have my own copy—it’s signed too! Nice! Do you have any favourites from the book? The family related pieces are my favourites. There is a prose poem called “Bread” that I especially like — inspired by one of his grandparents, I believe. Then there is a funny one called “Getting the Marriage into Bed” about his experience of becoming a sudden father when he married a woman who had three children! “Bread” is one of my favourites, and the reason I decided to read the book. And with three kids, I could relate well to “Getting the Marriage into Bed”! Love the spine poetry at the end of your blog – fun idea!! Poetry is not generally my genre of choice but I am trying to introduce some poetry and short stories into my reading this year! I read a collection of poems called Fat Girl by Jessie Carty, and mostly it seemed like the speaker was picking out parts of her body she didn’t like and talking about why she didn’t like them, or why they were unremarkable, or how she didn’t hate them when she was a kid because she was not yet self-conscious. It wasn’t good. I do tend to like more story-drive poems, too. The ones you’ve reviewed her definitely sound like collections I would want to read. I’m glad these appeal to you! Hmm… the ones you’re describing from “Fat Girl” don’t sound like my kind of thing, either. I try to make it to poems.com everyday. They post a new poem by a different poem everyday, and mostly it is contemporary poets. A may go a week before I find a poem I really like. I am also working my way through William Wordsworth’s Prelude and Frances Mayes’ wonderful introduction to poetry called “The Discovery of Poetry”. Molly Peacock also has a book out called, “How to Read a Poem…: and Start a Poetry Circle” Both Frances Mayes and Molly Peacock are excellent introduction to poetry for anyone who would like to be more comfortable with poetry. I have long suspected that I would like Molly Peacock’s poems – ever since reading her book “Alphabetique”. She is a wonderful poet. In the book, she takes ten poems by other poets and discusses them. It’s where I came across Jane Kenyon’s lovely poem “Let Evening Come”. I keep meaning to get back to poetry! I read it more often as a high schooler and college gal. I’ve always loved it, though. You’ve inspired me! I must admit — I haven’t made time for poetry reading (I should), but I do love Michael Crummey since Sweetland. When I saw Crummey at an author event, he did read from his Little Dogs book and it was excellent. He recites his poetry so well. Though I want to read more of his novel backlist! My next favourite of his novels is Galore, and then River Thieves. But Little Dogs is good to have around to pick up whenever you have a few minutes! Even though I haven’t heard that interview but that’s exactly how I ended up reading MC’s poetry; I heard him in interview with Shelagh Rogers on CBC and even though I thought I’d only like his prose was so smitten with his reading and the stories behind those poems that I immediatley requested the volume and then fell even harder for his storytelling. Now I’ll have to find the interview you’ve mentioned (I’m behind on my listening while catching up with library reading)! For poetry lately, I’ve been reading Tracy K Smith (which I also think you’d like, Life on Mars), Martha Harvey, and Gregory Scofield. Have you read Soraya Peerbye? I think she’s awesome and was just checking again yesterday to see if she’s had anything new published recently. (No. Sigh.) Your spine poetry makes me giggle. (And makes me want a cookie. What doesn’t.) And I love the sound of Budge Wilson’s volume too; that’s such a powerful image of the human chain. Poetry seems made for capturing such scenes. I haven’t read poetry by any of those writers. But I’m not too surprised by that. It sounds like I might want to check out Soraya Peerbye and Tracy K Smith. 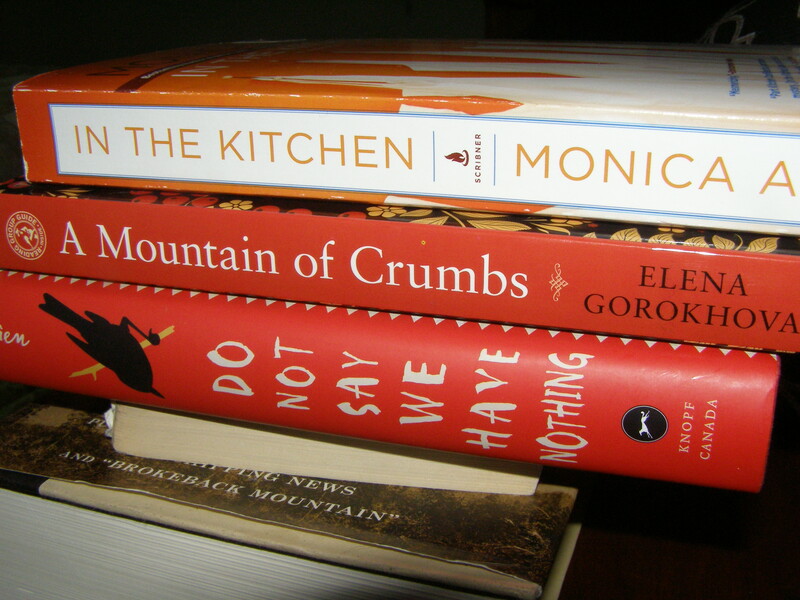 I love that book spine poem! I think that’s the best one I’ve seen so far. I wish I liked poetry more than I do, but it’s very rare for one to move me, and I’ve never been good at reading collections. Well done for trying to expand your reading range! Thanks, FF! Adding poetry to my reading has been slow-going, but I really liked these collections.